I am not a pastor. This book was written for pastors. I would not have purchased it, except that Amazon was giving the book away free. But given that I am not a pastor, I am from a family of pastors. My brother is a pastor. My father and three uncles are pastors. My grandfather was a pastor, etc. I went to seminary and worked for a denominational office for five years. Now I primarily work with church based ministries (mostly one after school program, but a few other small jobs as well.) I have a fairly good insight into the lives of pastors. This is a good book. I know that many of my friends that are pastors could use the reminder. This is not really focused on out of the box ideas, but things people just need reminded to focus on. There is a potential that some people will just feel buried by the 1o things they should be doing better. The last chapter really focuses on why that is the wrong attitude. But it is the last chapter and some people will not make it that far. It is written with humor and love for the church. Theologically it is oriented toward churches and pastors that are more church growth focused. 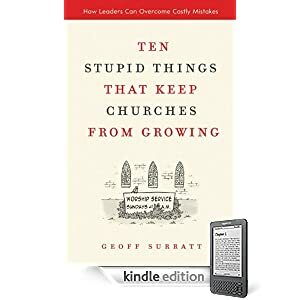 I do not believe any pastor wants their church to not grow, but there are some that believe that a church is only healthy if it is growing. Surratt would not say that directly, but people might think that he would say that. Nearly 2 pounds more than leaving the hospital. And about 1.5 inches longer.